. . . for the latest news and a timeline of posts that goes back several years. Click that Facebook icon to the right on this web page, or just click here. This unassuming scientist has spent hundreds of hours underwater, going back to the mid-20th century, and to get to know Earle is also to get to know her work as a marine biologist and her message – a message echoed by a half-dozen others in the film, including film director James Cameron, who pretty much divides his time these days between making blockbuster movies and pursuing ocean exploration. In a media world awash in vines and videos and various forms of programming focused on so many who have often done relatively little, it is refreshing, and often inspiring, to spend 95 minutes watching a film that gets us better acquainted with someone like Earle who has done so much – and continues to, even as she dauntlessly approaches the age of 80. She is still diving, still lecturing, still traveling and tirelessly speaking out about a truth that’s as inconvenient as any Al Gore revealed. 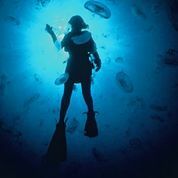 Earle’s inconvenient truth, and the central message of “Mission Blue,” is that the oceans of the world, Earth’s life support system, are in imminent danger of passing a point of no return. There are few better messengers than Earle, who has dived the world over and has personally seen the troubling changes in the marine world. Like a biologist who returns to the Amazon to find swaths of forests gone, Earle revisits places like an area in the Coral Sea, a sizable swath of ocean to the east of the Great Barrier Reef. Earle first dived there in the 1970s, and in vintage footage we see glimpses of a kind of undersea Garden of Eden and the pristine realm she describes. We also see a thirtysomething Earle, who bears a remarkable resemblance to Sigourney Weaver around the time of her role in “Gorillas in the Mist,” in which she played Dian Fossey, another scientist with a mission (and, incidentally, “Mission Blue” co-creator Robert Nixon was a “Gorillas” co-producer). At a spot in the Coral Sea about 100 miles east of Australia, Earle takes a dive with several others, including filmmaker Stevens, and we see a coral reef that looks like the ashen, charred remains of a lush landscape incinerated by fire. “We’ve come out all this way, and all we find are ruins. The place Sylvia remembered so vividly is gone,” says Stevens, as narrator. This film furthers that goal, and as a bonus viewers get to know something about Earle and her achievements, including such milestones as her role in Project Tektite II in 1970. Tektite, a spinoff of the U.S. Navy’s experimental sea-floor bases called SEALAB I, II and III, became a career booster for Earle by making something of a media event out of the all-female team of aquanauts who spent two weeks diving, living and working at this sea base off the coast of St. John in the Virgin Islands – just like the previous all-male teams of aquanauts. (Yes! Women can do this diving stuff too!) The site where Tektite had been placed, 45 feet below the surface, is another that Earle revisits in “Mission Blue,” and she finds yet another seascape where life has clearly gone missing – “dead zones,” as badly degraded areas are called. But it’s not too late to restore sea life, and one of Earle’s immediate goals, as mentioned in the film, is to work to increase the amount of protected marine areas from less than 5 percent globally, as is the case today, to 20 percent by 2020. Earle’s message is also one of hope – as in the protected “Hope Spots” she wants to see created – which should give us all hope, especially since it’s coming from Her Deepness herself. But in order to sustain hope, we all need to take action, as “Mission Blue” forcefully reminds us, with Earle leading the way, as she has now for years. Captain Walter Francis Mazzone, a veteran of harrowing World War II submarine patrols who later in his career became indispensable to the U.S.Navy’s SEALAB program, died today. He was 96 and had been in remarkably good health, living at his longtime home overlooking Mission Bay in San Diego and keeping up with lifelong favorite hobbies, like making works of stained glass and doing painstaking restorations of antique clocks. Mazzone’s career took a fateful turn in the late 1950s when he was introduced to Captain George F. Bond, head of the Medical Research Laboratory at the U.S. Naval Submarine Base at New London, Conn., where Mazzone was working as a top administrator. Captain Bond, the iconoclastic Navy doctor who would become the father the SEALAB program, was then starting a round of laboratory experiments at the base to figure out whether divers could stay down longer and reach greater depths than ever thought possible. Bond was aiming for historic breakthroughs in deep diving that would enable divers – “aquanauts,” as Bond liked to call them – to live and work for days at a time on the seabed in a properly equipped and pressurized base, something like the marine equivalent of a space station. This was revolutionary thinking at a time when conventional wisdom held that divers couldn’t go very deep, and their stays at any significant depth would have to be limited to a matter of minutes – not the hours, days, weeks and even months that Bond envisioned. Fortunately for Bond, and for the history of diving, Mazzone was intrigued by Bond’s vision and by the physiological puzzles that would have to be solved. Not everyone was – indeed some in the Navy regarded Bond as somewhat of a crackpot. But Mazzone, an innately inquisitive man, got involved with running the early lab tests and would become Bond’s right-hand man throughout the 1960s until the final SEALAB came to an end in 1969. Without Mazzone, it’s unlikely that Bond would have gotten as far as he did with the SEALAB program or the advances in diving methods and technology that had a swift and lasting impact on military and civilian diving, and perhaps most notably on commercial diving operations. While Bond was a charismatic visionary, an able scientist and an ardent spokesman for the cause of creating sea bases and equipping divers to reach greater depths, Mazzone was the energetic, ever-resourceful stickler for details, such as those involved with running experiments on animals and later human volunteers to prove the revolutionary concept of “saturation diving,” the key to the deep, long-duration dives that Bond hoped would make sea dwelling possible. Mazzone went on to play key roles in all three SEALAB sea trials, the first one off the coast of Bermuda, in 1964, and the second two off the coast of Southern California, in 1965 and 1969. He wore many hats throughout the project and while he could be tough, he was also a highly respected and trusted figure, sometimes affectionately called “Uncle Walter” by the SEALAB crews, whose lives were often quite literally in Mazzone’s hands. Mazzone put in long shifts on the surface, aboard vessels that served as SEALAB mission control, where he monitored life-support systems and hours-long decompression procedures, among other tasks critical to the safety of SEALAB aquanauts and to the success of the Navy’s newfangled undersea operations. Even before Mazzone met George Bond and got involved with the nascent SEALAB program, he had made his mark as a young officer on submarines during World War II. His first war patrol, aboard the USS Puffer, became renowned in the cat-and-mouse annals of sub warfare after the diesel sub and its crew endured thirty-nine hellish hours of near continuous depth charging by Japanese destroyers in the Makassar Strait, around the eastern side of Borneo. Following a highly successful second war patrol on the Puffer, Mazzone transferred to USS Crevalle, on which he completed five more war patrols. One patrol was exceptionally noteworthy because it involved a highly classified mission to the Island of Negros in the Philippines to retrieve documents vital to the war effort as well as the rescue of 40 individuals who had been hiding from the Japanese. Mazzone received the Silver Star, the third highest award for Valor, the Bronze Star with Combat V and the Navy Commendation Medal with Combat V for his submarine service in World War II. Born Jan. 19, 1918, Walt Mazzone was the only child of Frank and Pearl Mazzone, Italian immigrants who had settled in San Jose, Calif. His father worked in manufacturing jobs related to California canneries and his mother worked for department stores. Walt Mazzone was determined to pursue a more white-collar career. With his sights set on medical school, Mazzone attended San Jose State College, not far from his family’s home. In college he was a boxer and graduated with a degree in biological and physical sciences in 1941, six months before the Japanese attack on Pearl Harbor and the U.S. entry into World War II. So instead of heading to medical school, 23-year-old Walter was soon headed to war. He was among the first college graduates to be routed into an expedited three-month officer training program, bypassing the Navy’s traditional submarine school as part of an effort to speed up the process of getting officers onto boats, where they could then get the rest of their education on the job while at war. Mazzone did his officer training at Notre Dame and Columbia universities. He was commissioned as an ensign and assigned to the Puffer. After the war Mazzone was released from active duty in November 1945 and returned to California, where he enrolled at the University of Southern California School of Pharmacy and graduated in June 1948 with a bachelor of science degree in pharmaceutical chemistry. While at USC he met Lucie Margaret Oldham, a school teacher working in the nearby community of South Gate. They dated for two weeks and became engaged in May 1946. They were married on June 29, 1946. Mazzone took a job at his uncle’s pharmacy back in his hometown of San Jose, where his and Lucie’s only child, Robert Walter, was born in March 1949. Pharmacy work made Mazzone restless and in 1949 he joined the Navy’s newly formed Medical Service Corps, just in time for the Korean War, and was stationed in Occupied Japan at the newly commissioned U.S. Naval Hospital at Yokosuka. In 1951 he was transferred to Brooklyn, New York, and within five years became a high-ranking manager in the Armed Services Medical Procurement Agency, where he was responsible for big budgets and vast supplies of blood, blood derivatives, drugs and chemicals. Mazzone might never have gone to New London or met George Bond if not for a craving for a Nedick’s hot dog. One day at lunch, he and his boss left their office near the Brooklyn shipyard and hopped a subway over to lower Manhattan. While walking near the venerable hot dog stand Mazzone ran into a former submarine medical officer who wondered aloud why Mazzone was not working in some capacity for the Submarine Service, given his distinguished wartime experience and interest in the boats. Mazzone agreed, and the officer apparently pulled some strings because Mazzone soon received orders to head the School of Submarine and Diving Medicine at the U.S. Naval Submarine Base at New London, where most American submariners got their specialized training. The school trained medical officers and enlisted rates for independent duty aboard submarines. In the fall of 1958, not long after arriving at New London, Mazzone first crossed paths with George Bond at the base’s Medical Research Laboratory and heard Bond talking about the need to do research focused on figuring out whether it would be physiologically possible, and also practical, to house divers in pressurized undersea bases. Mazzone was not easily impressed, but he was struck by Bond’s can-do bravado and a partnership was born that would produce game-changing advances – and adventures – in the science and medicine of deep diving. By 1962 Mazzone was reassigned to the Medical Research Lab as head of operational medicine. Among other duties, he took a leading role in running the lab experiments that Dr. Bond dubbed Project Genesis to prove the viability of saturation diving, the key to deeper, longer-duration dives than ever thought possible – and ultimately the key to housing divers in pressurized sea-floor bases. Mazzone also got trained as a diver and was involved in the development of improved escape methods for trapped submariners – he and another officer tested a newly-developed piece of gear by surfacing on their own from out of a submarine at a depth of 318 feet, a record escape at the time. In the early 1960s, eager for more knowledge about the challenges they faced as they moved from laboratory simulations to the first SEALAB trial, Mazzone made time to earn a master’s degree in environmental physiology from Harvard’s School of Public Health. By then a commander in the Medical Service Corps, Mazzone was promoted to captain on Feb. 1, 1963. From the SEALAB program’s very beginning to its tragic, premature end, Mazzone was at the center of it all, as is readily apparent in SEALAB. After retiring from the Navy in 1970, Mazzone settled in San Diego, which had become a base for SEALAB operations, and worked for the next decade at the Navy’s Ocean Systems Center at Point Loma. He then left government service and began work at Scientific Applications International Corp. At SAIC he was a program manager on several Navy contracts until 2002 – and finally retired at the age of 84. The garage at the San Diego home where he had lived since 1970 doubled as a workshop for his stained glass and clock repair hobbies. Only recently did Mazzone curtail his annual motor home trips. His beloved wife, Lucie, died in October 2012, and he is survived by his son, Robert Walter Mazzone, a retired Navy captain who resides with his wife in Escondido, Calif. He is also survived by two grandchildren and their spouses, Margaret Pearl and William Clifford of North Hampton, N.H., and Michael Robert and Ashley Mazzone of Bristol, R.I., as well five great grandchildren – Carolyn Clifford, Josephine Clifford, Annabelle Clifford, Ely Mazzone and Callen Mazzone. He is also survived by his two sisters-in-law, Mary Schaffer and Sue Anderson, both of Los Angeles, as well as numerous nieces and nephews and cousins. Donations in lieu of flowers can be made to the Man in the Sea Museum, 17314 Panama City Beach Parkway, Panama City Beach, FL 32413. One of the museum’s major projects is raising money to do a full restoration of SEALAB I. The original hull, rusting but repainted and still largely intact, sits just outside the museum. For all the latest . . .
. . .news, tidbits and commentary, be sure to check out my Facebook Author Page. Any “likes” appreciated, of course, if you feel so moved . . .
I’ll be giving a presentation on SEALAB during this big annual event and will also be at the Historical Diving Society USA’s booth (no. 733) to chat and sign books on June 8 and June 9. Novo prednisone 5mg side effects for complete details and hope to see you there. How wonderful to find the enthusiastic review of SEALAB in the current (March/April) issue of UnderWater, the major magazine of the commercial diving industry. It’s great to have publications ranging from UnderWater (one for the experts) to those like Parade (one for Sunday newspaper readers) all finding SEALAB to be a compelling and worthwhile story. For these and other reviews please see my Reviews and Praise page. An excerpt from my recent live interview with Bill Leff on radio station WGN, “The Voice of Chicago,” is now online, as is my entire half-hour segment with Simon Morton, presenter of “This Way Up,” on Radio New Zealand. Many thanks to these veteran hosts for their interest in SEALAB and for giving me the opportunity to share some highlights of the story with listeners on both ends of our blue planet. The current cover story in The New York Review of Books, “Diving Deep into Danger,” cites SEALAB as a key source and calls it “a deft account of deep diving history.” Many thanks to writer Nathaniel Rich for that bit of recognition. 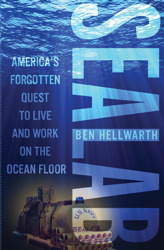 His article is itself a deft account that focuses on deep commercial diving (a beneficiary of the U.S. Navy’s SEALAB program, as readers of my book know) and he opens with the historic – if tragic – story of the first thousand-foot dive, a dive I describe in some detail in SEALAB because of its notoriety in those pioneering years of the early 1960s. I’m happy to report that my SEALAB presentation has been accepted for the seminar program at the 43rd Our World – Underwater, the Midwest’s largest dive & travel expo and one of the largest such conventions in the U.S. I’m scheduled to give my talk twice during the three-day event that starts Feb. 15, 2013, at the Donald E. Stephens Convention Center. It’s great to be able to bring the SEALAB story to the Chicago area and I’ll be in exceptional company, as you can see on the seminar schedule. My scheduled talks are also listed on my website’s Novo prednisone 5mg side effects. Book signing times TBA. The Historical Diving Society of the United Kingdom has given its Dr. Art Bachrach Award for 2012 to SEALAB “for contributions to the literature of diving history.” I was of course honored that a group with this depth (!) of knowledge would single out my book for its annual award. As it happened, the award was given in Birmingham, England, on Nov. 10, the same day I was giving a SEALAB presentation at the 20th anniversary conference of the Historical Diving Society USA in Santa Barbara, Calif. Ideally I would have been able to receive the Bachrach award in person, but I probably got better weather.